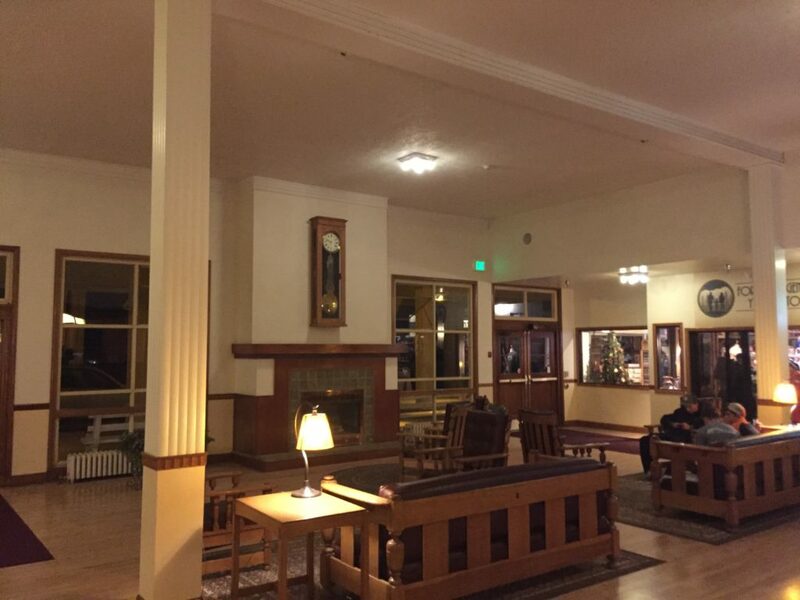 Although the Mammoth Hot Springs Hotel was quiet during the night, the hallways were rather noisy in the morning. This was not due to unruly guests, but due to the hotel’s design. The hallways are long and solidly built, but with high ceilings and widely spaced walls. The tunnel effect seemed to amplify sounds, making noises louder when people were hauling their bags down the hallway to check out of their rooms. However, housekeeping did not awaken us and did not show up at the door until 10:45 am, which was after we had already returned from breakfast and had all of our things ready to leave the room. Even though we were about to leave, the housekeeper apologized to us and said he would return to clean our room later. There was no coffee in the room, so I used some of the Trader Joe’s instant coffee packets I’d brought with me while everyone else was still asleep. Unfortunately, I reached the end of my coffee supply and had to venture out to the lobby to get a fresh cup. The coffee was ok and good enough to do the job, but it was not a high-end brew and tasted slightly burnt to me. The cups were small, which made me wish I’d brought my own coffee mug or thermos to the lobby with me. For breakfast, we went to the Mammoth Springs Dining Room for the breakfast butter. Breakfast is also available at the other restaurant, but we were in the mood for a more upscale dining experience. After having eaten so much bad food the day before, we wanted to eat something that would get us a good start to the day. The meal turned out to be a small improvement over the previous day’s food, but the restaurant is owned by the same company so the meals continued to be similar. At least the eggs on the buffet were not dry and overcooked like they were at the Snow Lodge, but the buffet was a reputation of the same meal we kept seeing over and over. On a positive note, the chef was clearly more conscientious about the food he prepared than what we encountered at other locations operated by this company, and our waitress Anastasia (from Belgium, I believe) was very charming and attentive to our table. Good service always improves an otherwise average meal. We went to the Albright Visitor’s Center, which we had originally planned to see the previous day. In retrospect, this should have been our first stop. I was surprised to see how packed it was, even with a crowd of people just hanging out on the front porch. I quickly discovered why – the Internet! The visitor’s center had free wifi access, so people who had been without internet service or a cell phone connection were taking advantage of the opportunity to reconnect with the outside world. 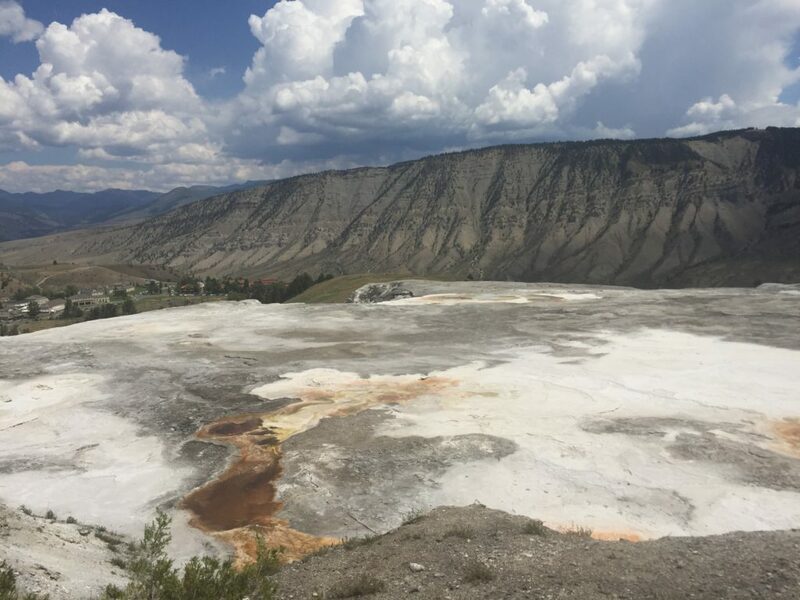 After indulging in access to the outside world, we explored the Mammoth Hot Springs Terraces. It is a similar experience to the other hot springs parks we explored, but this one is definitely worth a visit if you are in the town. 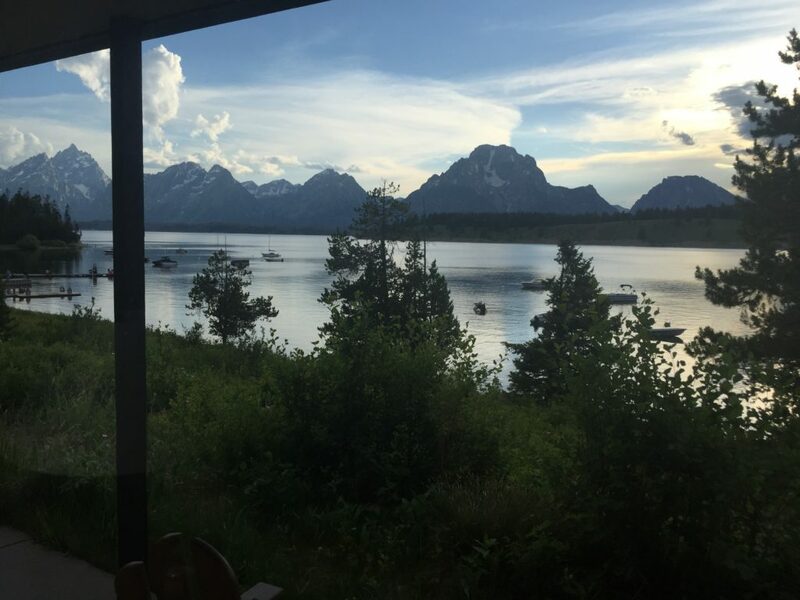 Our itinerary had us returning to Grant Teton National Park to spend more time in the Jackson Lake area. We had reservations at the Signal Mountain Lodge, which is one of the most expensive places we stayed during the trip. It also turned out to be my personal favorite out of the places we stayed. To get there, we changed part of our route for the first part of the drive to see places we did not see on the way in to Mammoth Springs, but then retraced our path for the latter part of the journey. Sulfur Cauldron was close to Mud Volcano and Dragon’s Mouth Spring that we visited the previous day, so we decided to stop there. It was an impressive site, but we should have gone there immediately after seeing Mud Volcano. The two sites are too close together to split into separate visits, especially since it doesn’t take long to explore Sulfur Cauldron. Another small stop we made along the way was at the Museum of the National Park Ranger. 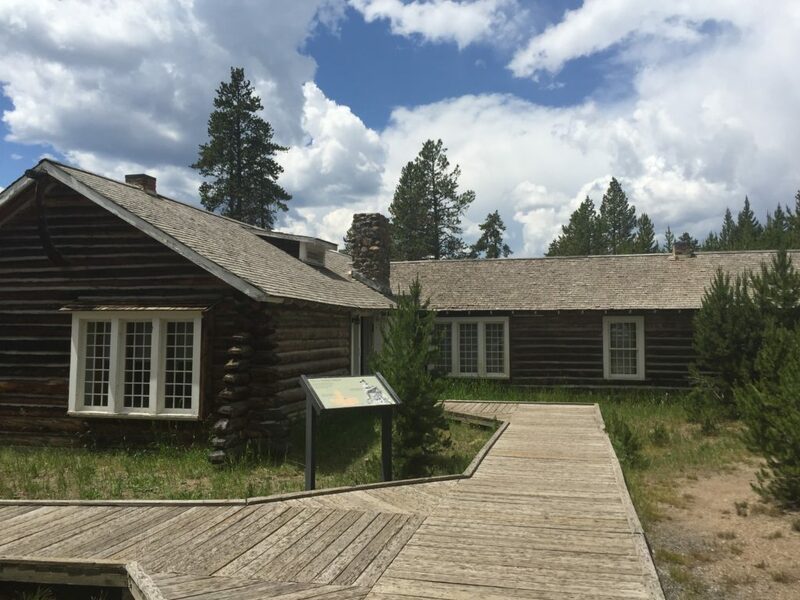 The ranger museum is a small but interesting place to visit that documents the history of the park rangers. It does not take long to see all of the exhibits, but they also have documentary films playing in one of the rooms. It is good place for a short stop during your travels. 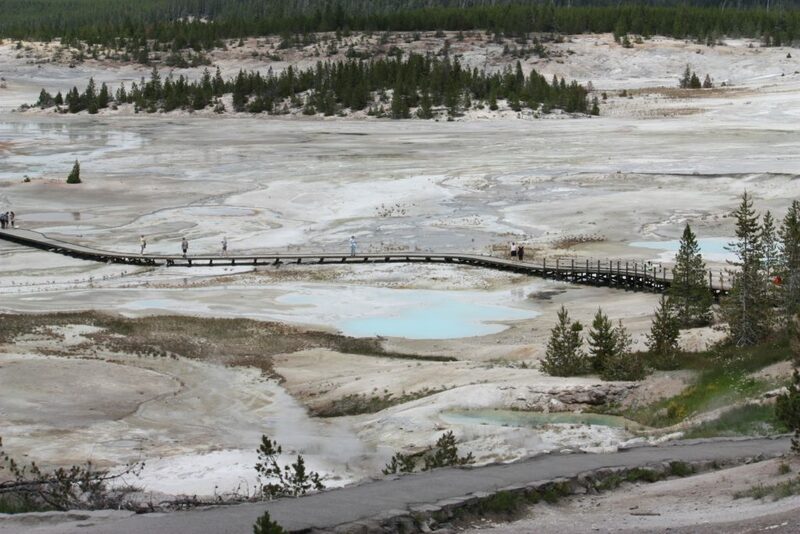 Not far past the ranger museum was the Norris Geyser Basin Museum and the Boardwalks at Norris Geyser Basin. The museum turned out to mostly consist of a couple of rooms with some charts and illustrations, but the walk through the geyser fields was great. The most fun part was probably the encounter with a tiny mouse-like creature that quickly drew an adoring crowd. While it is “against the rules” to touch wildlife or engage in rescue efforts, a young woman decided to pick it up and relocate it to a brushy area. No one objected, as the likelihood of someone accidentally stepping on that tiny creature was too heartbreaking to ignore. After a few more stops along the way (including joining a big crowd gathered on the roadside due to a wolf sighting), we reached our destination of Signal Mountain Lodge back in the Jackson Lake area. The Signal Mountain Lodge has wifi, which provided a chance to check email and connect to the outside world. The accommodations were not elaborate but were nicer than many of the places we had stayed during the trip. Dinner at their restaurant consisted of a sirloin for me and a trout for my wife. The kids both ordered pasta with meat balls. My sirloin was too small but otherwise was fine. The children liked their pasta but did not like the meatballs (which cost extra). Signal Mountain Lodge has a general store and coffee shop with barista service plus a beer cooler in the back. We picked up some bacon and eggs so that we could make breakfast for ourselves in the morning. The nighttime atmosphere at Signal Mountain Lodge on our first night was interesting. The most accurate word that comes to mind is spooky, and I don’t know why because nothing about it seemed particularly dangerous. I made several trips to the car after dark to get things we needed or wanted, and each time I went outside it was darker and creepier than before. Later in the evening my wife decided to go outside for stargazing, but she quickly decided it was too scary for her and came back too. You are on the edge of the wilderness in a place like this, and the darkness can be scary there. That said, our second night there did not seem spooky or scary at all, and I even walked from our cabin to the registration building for a late-night water refill without feeling the slightest bit nervous. I have no idea what made the difference between the two nights. The beds and the pillows were nice and comfortable, and were a significant improvement over other places we had stayed. While the walls were thin enough that you could hear the neighbors, everyone was either asleep or being quiet during the morning hours. In addition to wifi, the rooms had a refrigerator, microwave, coffee pot, dishwasher, dishes, a great view from a nice dinner table, and a comfortable couch. This was my favorite place that we stayed during the trip, and it certainly had the best view from our room.